As a kid I was quite claustrophobic, I have my theories as to why, but suffice to say for a very long time I completely avoided situations where it might become an issue. So a few years ago when my dive buddy Sam started talking about cave diving to me it was not even something I entertained as a possibility, it was a completely foreign concept. This was until I took a trip to the Solomon Islands and dived some ocean caves called creatively enough, Dark Cave, Open Cave and The Sinkhole. Of all the diving I did on that trip, and there were some awesome dives, those were by far my favourite. Far from feeling claustrophobic, I felt exhilarated and excited and I just wanted to do more. The beauty of an underwater cave has to be experienced, it can’t be described. But they are spectacular. So the next thing I know Sam and I are packing up the car for the 18 hour drive to Mount Gambier in South Australia so I could complete my CDAA (Cave Divers Association of Australia) Deep Cavern/ Sinkhole and TDI Cavern courses. A glutton for punishment I decided to learn in the middle of August so we loaded up the thermals, jackets, drysuits and handwarmers, and prepared to face the elements. We arrived at the house and met my fellow students. As always happens when you get a group of divers together for the first time, the war stories come out. I realised I was amoungst good company. There was a lot of experience around the table, and yet we were all beginners at this style of diving. As an instructor you need to have at least some confidence in your abilities, it’s part of the job. To make students feel comfortable you have to be able to instil confidence. But to say I was a little unsure of myself would be an understatement. Luckily Gary and Linda were fantastic instructors and made the course not only informative but great fun. We started by going through gear set up and making a complete mess of the backyard learning reeling skills. Each morning we went through some theory before heading out for the dive. Some of the things we studied were accident analysis, underwater communication and the importance of the five “Golden Rules of Cave Diving” initially created by the famous Sheck Exley. We were also shown around Mount Gambier, from the different places to stay, where to get air fills and the dive sites of Mount Gambier. Being a country town there were different methods to gain access to each site, ranging from signing up with the local Parks and Wildlife office, to knocking on the door of the farmer who owns the land and asking for the key. We completed most of our in-water training in Gouldens Sinkhole. The water was pretty chilly, and the vis was not great but we all knew we were there to learn the important stuff so we could see the cool stuff later. The first dive was a bit of a check out dive, giving the instructors a chance to have a look at us in the water and fix any gear that needed to be streamlined. We then went on to do the course dives over the next three days. We learned skills such as reeling and tie offs, buoyancy skills, propulsion techniques, out of air scenarios, black out scenarios and tactile communication. In an environment where one misplaced fin can cause a silt out, these skills are repeated and perfected throughout all levels cave courses and essential to cave safety. The culmination of the Gouldens training ended with the famous “Stress Test”. This consisted of reeling back to the exit in buddy teams, without mask, while sharing air, without breaking the surface. It was actually not as hard or as stressful as it sounds. It required all the skills we had been practising over the last few days. From buoyancy, to reeling, to how to handle a silt out (zero vis), it was all in play. But we all made it through. We were rewarded by finally getting to dive two of the most beautiful cavern/sinkhole systems in Mount Gambier, Picanninie Ponds and One Tree. We split into two groups, half of us went to One Tree while the other group went to Picanninie Ponds. One Tree is one of those sites where you have to knock on the farmers door to gain access. We drove out to the middle of his paddock, dodging cows and remembering the number one rule of the country, if you open it you close it. What I thought we would find in the middle of a cow filled paddock I can’t remember, but it certainly wasn’t what we found. Behind that unassuming facade there was a 40m deep sinkhole with crystal clear water. The limestone walls stretched up around us, making me feel insignificantly small by comparison. Our next dive was at Picanninie Ponds. Swimming through the first section it looks like any freshwater pond surrounded by reeds. But once you swim over the ridge you drop down into a chasm formed by two rock walls. Swimming through this chasm with 100+ meters vis was beautiful enough, but once we reached The Cathedral I knew that all the skills and stress tests were worth it. We reeled through a spilt in a rock into the aptly named cavern. This was natures cathedral, high ceilings, limestone walls and stunning rock formations. The different colours of our dive lights bounced off the limestone walls creating an underwater light show, and with the sunlight streaming in from the entrance throwing shadows across the walls, it was simply an amazing experience. I was technically still on the course at this point but I was swimming around in such a daze at the beauty of it all that I forgot for a moment. We ascended after this dive, big grins all round, we were now certified CDAA divers. After the course myself, Sam and two of the guys who did the course with me, Luke and Mark, stuck around so we could get some more dives in. Over the following week we dived Picanninie Ponds countless times, pleased we didn’t have to take our masks off, or do stress tests we were really able to explore and enjoy. It’s hard to describe how a rock can be beautiful, so I’ll just say what I say to everyone, you just have to see it for yourself. We did a night dive there, making the light show I described above even more breathtaking. Finally our last weekend was spent diving Kilsby’s sinkhole. Once again the sinkhole was in the middle of a paddock on a working farm. We walked our tanks down to the diving platform and had a quick look over the side. I could see the bottom of the sinkhole, at least 40m below me. We geared up and practically ran down. Once I broke the surface I realised that not only could I see the bottom, but I could see all edges of the sinkhole. Luke exploring a wall 50m away was just as clear as my dive buddy next to me. We were diving with CDAA member number one, which was a bit of a thrill but nothing could quite match the feeling of gazing around a dive site and seeing all four corners as if there was no water between me and it. As with all the other sites the architecture of the rock was awe inspiring, and to this day this remains one of my favourite dive sites. 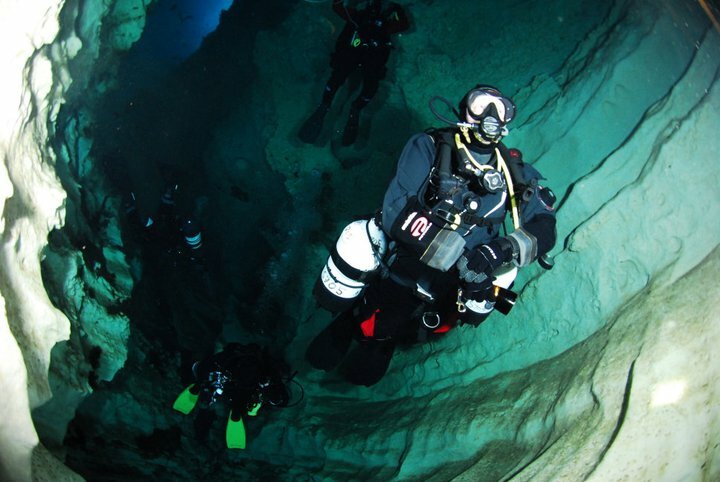 Check out the Cave Dive training trip Abyss is running to Thailand.